Having a baby that cries non-stop for hours on end is incredibly stressful for any parent. So is it colic or something else, and can you actually do anything about it? We spoke to an expert for the lowdown, and it turns out that simply helping parents manage it better and accept they may need to ‘ride it out’, could be the key to relief. One in five babies will have colic; however, the term is often bandied about with little understanding, and various treatment methods have been debated for many years. A lot of babies can also have it and not be diagnosed, or be misdiagnosed when there’s another issue to blame. 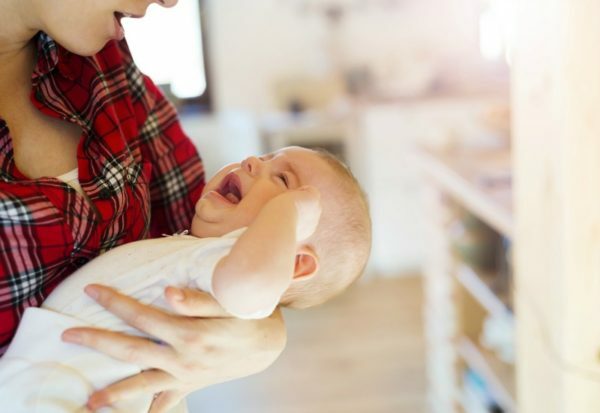 According to Murdoch Children’s Research Institute researcher and infant colic specialist, Dr Valerie Sung, the latest definition of colic is when parents interpret their baby’s crying as excessive (and all medical and organic reasons such as hunger, allergies and illness have been ruled out). And while all babies have a peak crying time between the age of six and eight weeks, those with colic will cry A LOT until they’re at least three to four months old. So is colic really that bad? A colicky baby can also result in other issues for mums and dads such as post-natal depression, anxiety, sleep deprivation and relationship problems; but interestingly the baby herself isn’t so affected. According to Dr Sung, if your baby is crying excessively, the first thing you should do is see a doctor to rule out any underlying medical problems to put your mind at ease. An allergy to cow’s milk protein could be a cause for babies; however, this usually comes with other symptoms such as not feeding well and having mucus in their poo. The only test method for this is to remove dairy from the mother’s diet (if breastfeeding) or switch formulas and look for a response. Gastro-oesophageal reflux is another condition which can cause a baby to be upset. However, as all babies get this in some form, it’s only really an issue if they’re feeding poorly and not putting on weight – which is often caused by something else. And while a lot of babies are being diagnosed with reflux these days, it’s possible they have colic instead. According to Dr Sung, although a baby who is screaming non-stop is tough on everyone, it doesn’t necessarily mean she’s in pain, it’s just her way of communicating. “One misconception is that people think when a baby is born they can be put down easily and go to sleep with no dramas, but not all babies do that. And that’s completely normal,” she says. Once you’ve ruled out any medical issues, Dr Sung believes the best things parents can do is to try and relax. Remember that colic is a normal phase that WILL get better with time, and in the meantime do whatever is necessary to settle your baby – rocking, holding, singing – you name it. Studies from around the world have shown that although African mothers who breastfeed their babies all the time and carry them everywhere still hit a peak crying time at six to eight weeks. However, it’s only for three minutes at a time. In London, though, babies left to settle have resulted in five to six hours of crying at the same age. “I reassure parents all the time that you can’t spoil a baby in the first three months of their life, and to forget about self-settling techniques until they’re at least three or four months old,” says Dr Sung. If you’ve tried everything and are at your wit’s end though, one colic treatment that has been proven to work regarding reduced crying is a very specific probiotic containing the Lactobacillus reuteri (L reuteri) strain. Annoyingly though, the studies only show it to be effective in babies overseas who are exclusively breastfed. For some unknown reason, local trials have shown no effect on Australian babies, which could be to do with our gut bacteria make-up. However, Dr Sung says if parents are desperate it could be something to try. BioGai Probiotic Drops is the only product in Australia which contains L reuteri, and you can buy it over the counter at the chemist or online for around $35. If you do have a baby with colic though, the most important thing Dr Sung says you can do is to get as much support as possible to help you through what can be an incredibly stressful and exhausting period. “We used to have a lot of people around helping and now we’re more isolated and left to our own devices, so it’s important to get the help that you need for practical things to get by, like having a shower or getting something to eat,” she says. So, mums, the lesson is clear – if you’re one of the five women at home with a colicky baby, don’t try and be a superhero. Accept that friend’s cooked meal or your mother-in-law’s offer to take the baby for a walk, talk to your partner and tell them you need help or hire some help if you can afford it. And remember that reprieve is not far away so hang in there! For more detail on the latest findings around colic from Dr Sung, you can read an article she published recently here in Australian Prescriber. Did your baby have colic? How did you get through it or what techniques did you use? Tell us on Facebook!